The flavour of PEI oysters reflects the water quality, minerals, salinity and type of nutrients available in the water. PEI has a variety of bays, coves and estuaries that provide numerous distinct taste profiles for the oyster connoisseur. Health Fact } PEI oysters are a great source of protein and high in zinc. Scrub oysters under cold running water to remove any dirt or sand; do not submerge. Shuck oysters, save oysters and oyster liquor. Set aside until ready to use - discard shells. Heat grill to medium high. Heat saucepan over medium-high heat; add the canola oil. Add the cremini mushrooms and garlic; reduce heat to low and cook for 3 minutes, add the enoki mushrooms and radicchio lettuce and continue cooking for 2 minutes. Add the balsamic vinegar and honey to the pan and bring to a boil; reduce heat and simmer for 1-2 minutes. Add the oysters and oyster liquor to the pan; season with black pepper. Cook for 1-2 minutes or until heated through. Grill or broil bread and place onto a serving platter. 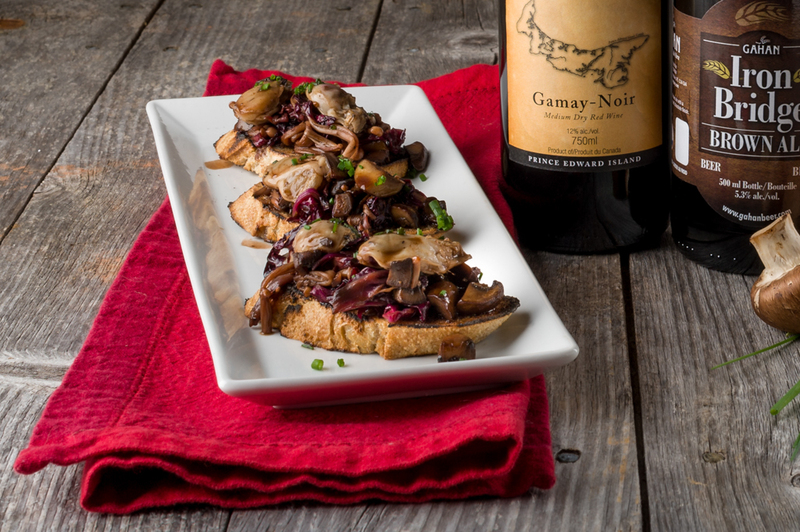 Top each toast with oyster-mushroom mixture and garnish with chives.